Towards the end of the 1880s an artists’ colony emerged in the town of Faaborg, in Funen, southern Denmark. Fritz Syberg, Peter Hansen and his sister Anna, Syberg’s wife, came from Faaborg and both men returned home after completing their art education at Kristian Zahrtmann’s progressive, anti-establishment school in Copenhagen. Faaborg Museum has a strong connection with this artists’ colony, one of the most important in Denmark. These Funen-born artists have acquired the rather pejorative reputation of ‘peasant painters’ (bondemalerne) as they made art which self-consciously distanced itself from urban living. Similar to other artists’ colonies in the late 1800s the ‘Funen Painters’ looked for an alternative to city life by setting up an art practice and a community based on both ‘art’ and ‘life’. They wanted to connect their art with the countryside and with everyday life and they created an overall vision for a ‘lifestyle’ reflecting their artistic ideals. 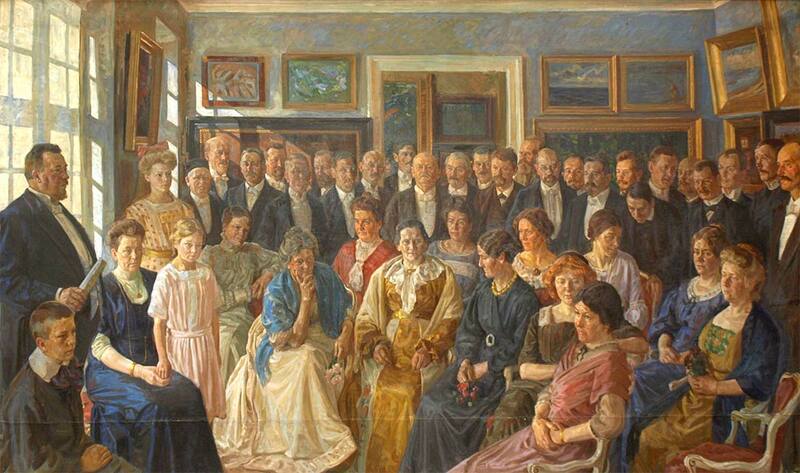 Peter Hansen, The Inauguration of Faaborg Museum, 1910-12. Faaborg Museum. Skagen Museum in northern Jutland, Denmark is another example of an artists’ colony connected with a museum. This museum was founded in 1908 in the dining hall of the town’s Brøndum’s Hotel. The painters Michael Ancher, P.S. Krøyer and Laurits Tuxen served on its first board of directors. There are also some parallel examples of artists’ colonies in Germany: Mathildehöhe, near Darmstadt and Worpswede, near Bremen have similar establishments founded for artists and art. Some of our painters were born in Faaborg, and some others are connected with the town, so this town is absolutely top-notch, a painters’ town. 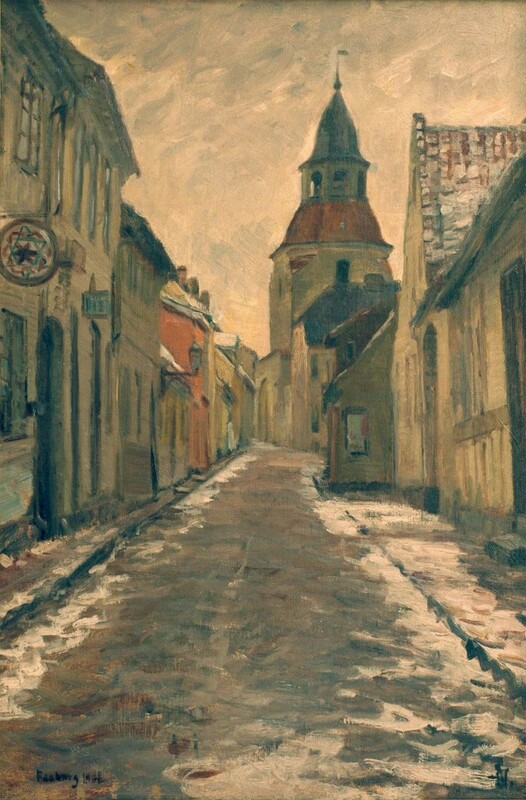 Albert Gottschalk, The Bell Tower. Faaborg, 1901. Faaborg Museum. 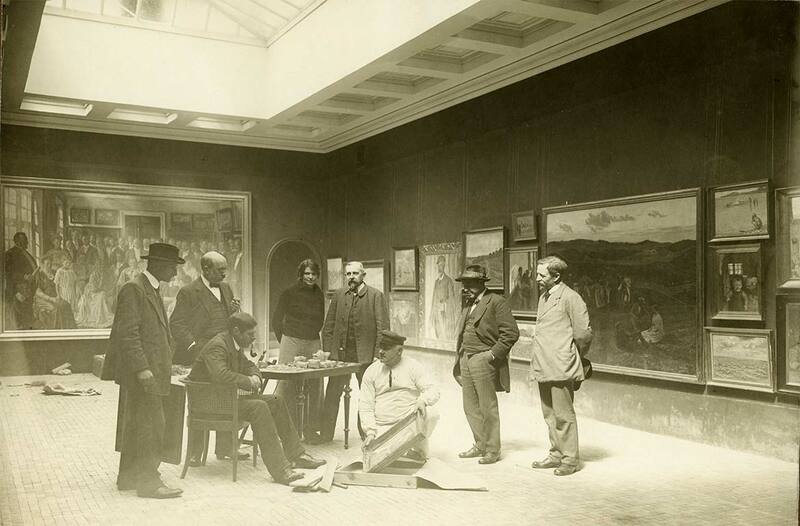 Artists hanging their works in the galleries of Faaborg Museum, may 1915. From the left: Peter Hansen, Peter Tom-Petersen, Johannes Larsen, Astrid Noack, Nicolaus Lützhøft, Christian Ernlund, Carl Petersen og Fritz Syberg. Photograph by Marius Mikkelsen. Faaborg Byhistoriske Arkiv.